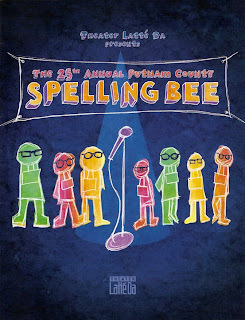 The 25th Annual Putnam County Spelling Bee, or in the case of Theater Latte Da's new production, The 25th Annual Seven County Metro Area Spelling Bee, is a delightful, hilarious, clever look at a middle school spelling bee and the characters that inhabit it. (And if you think this show is an exaggeration, check out the marvelous documentary Spellbound - truth is stranger than fiction.) I had seen the show twice before, once on tour and once on Broadway, so I already knew I loved it. And as usual, Latte Da's production of it is practically perfect in every way. One of the things I love about Latte Da is their impeccable casting, which is beautifully on display in this show. With the exception of Tod Petersen (creator and star of the funny, sweet, and very Minnesotan A Christmas Carole Petersen), this is a cast of Latte Da newcomers. And many of the actors who play the kids are kids themselves - college students or recent graduates. Artistic Director Peter Rothstein is intentionally focusing on casting young actors this season (a season which ends with one of my favorite new musicals Spring Awakening). And I think he may have discovered several stars of the future in this cast. My favorite of the six Spelling Bee finalists is Leaf Coneybear, with an adorably spirited and loopy performance by Alan Bach. Poor Leaf isn't your typical smart kid, he sort of ended up there by accident, and is having the time of his life. Logainne Schwarzandgrubenierre (Mary Fox, one of my Yellow Tree faves, who fully commits to creating a quirky character) is the lisping daughter of two dads, always trying to please them. Derek Prestly as last year's champion Chip Tolentino gets his (slightly embarrassing) glory moment after Chip is eliminated from the competition. Marcy Park (Sheena Janson, aka the sultry seductive man-eating plant Audrey II, in a totally opposite role here) is the stereotypical Asian student who's good at everything, but learns it's more fun not to be perfect. William Barfee (convincingly played by Joseph R. Pyfferoen) has nasal congestion issues and a magic foot, and unexpectedly develops a sweet friendship with a competitor. As the other half of that relationship, the slightly neglected Olive Ostrovsy, Cat Brindisi proves she has inherited her parents' many talents (her dad is Michael Brindisi, Artistic Director of the Chanhassen Dinner Theatres, and her mom is actor Michelle Barber), but has a spark and a spirit all her own. It's a pleasure to watch these six "kids" light up the stage with their talent. The "adults" aren't too shabby either. The hosts of the Bee are Vice Principal Panch (Tod Petersen) and former champion Rona Lisa Peretti (Kim Kivens). Tod and Kim are both spot-on in their characterizations of the tightly wound VP and the woman who looks back on her Spelling Bee win as the highlight of her life. Brian Frutiger plays convict-turned-counselor Mitch Mahoney, who hands the losers a juice box and escorts them off stage. He has a great voice; he's a member of the Metropolitan Opera in NYC "slumming" it in musical theater here in Minnesota. Whether stage veteran or relative newcomer, this show is perfectly cast. This show involves some audience participation; three audience members are called up to join the competition, which allows for some hilarious ad libbing by our hosts. It's great fun to watch the people on stage being led around by the cast, to see their reactions to the show going on around them, as well as the always in-character reactions of the actors playing with them. I'm not quite sure how it works, but I assume you can put your name in the hat before the show, so look for that in the lobby if you want to take your chances at the Bee. The 25th Annual Seven County Metro Area Spelling Bee is playing through the end of the month - catch it while you can. I'm going again at the end of the month, and I'm looking forward to seeing how the show has grown as well as the differences that new audience members onstage bring. Yellow Tree Theatre co-founders Jason Peterson and Jessica Lind were in the audience to support their friend and frequent collaborator Mary Fox, who is also responsible for the sound design in Yellow Tree's current show Steel Magnolias.